A live CD or live DVD is a complete bootable Linux operating system loaded from a CD or DVD. Although there are a lots of live Linux CDs, for seemingly every taste and purpose, it might still be useful on occasion to build your own. This guide details the steps to build a bootable live CD/DVD based on Debian “wheezy”. 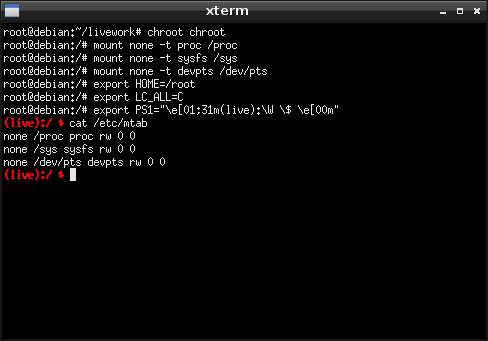 The new filesystem was created in ~/livework/chroot directory. It is time to chroot into the new filesystem and finish the installation. # export PS1="\e[01;31m(live):\W \$ \e[00m"
This is a very basic Debian system. On top of it you can install packages such as vim and ssh (apt-get install vim ssh), a desktop environment (apt-get install lxde), a web browser (apt-get install iceweasel) etc. When you are done, cleanup apt caches and exit chroot. I use GNU xorriso to build the final iso image. It creates an isohybrid image that can be transferred to a USB stick using dd command. 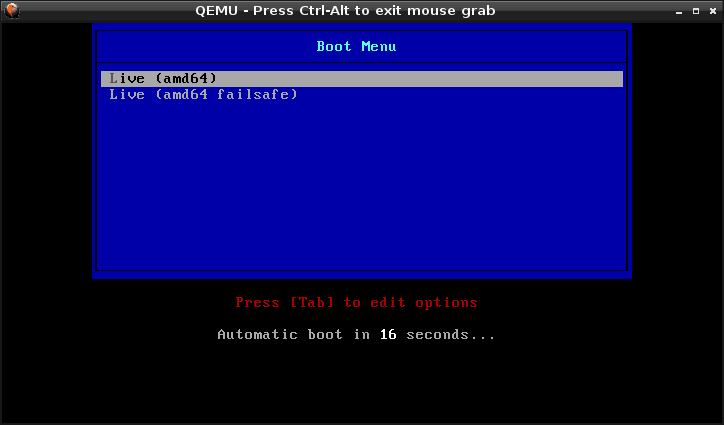 To quickly test the image use qemu (apt-get install qemu). Reboot your computer from the USB stick and you’ll be up and running in no time. In my case I’ve moved live-rw file on my Debian Linux partition. You can also put it on a NTFS partition, at boot time the software will find it and mount it. The iso image in this example has a size of 92MB. It is a basic Debian system as created by debootstrap, with only the necessary livecd executables. From here it will grow as more packages are added and the image is personalized. I have decided to document my steps in case anyone might find them useful. Please let me know if you run into problems, or if you have any questions or suggestions. I use these steps to build small network appliances, servers, and rescue disks, nothing important. I’ve never went as far as to build a full distribution. If you are considering it for a more serious project, better try live-build. Debian team uses live-build to build the official Debian CDs. The tool is very powerful and highly configurable, and it goes well beyond what I’ve covered in this example. This entry was posted in Linux and tagged Debian, LiveCD on September 21, 2013 by netblue30. Awesome! This will definately come in handy. Thanks! (change from $ to #) to show that the user is actually root, not a regular user. though I guess that’s just personel preference. but that’s just getting fancy. Also, mksquashfs is not installed by default. As you know, it’s part of the squashfs-tools package. isolinux.bin is part of the syslinux package, which is not installed by default either. Thanks for your suggestions. mksquashfs and syslinux are brought in automatically when you install live-build – at least this is what I remember. So ive been trying to get a background image to show up and I just cannot figure it out. For vesamenu.c32, sets the background image. The background can either be a color (see MENU COLOR) or the name of an image file, which should be 640×480 pixels and either in PNG or JPEG format. I have successfully used this to build the ISO … I cannot login at all. I went through the steps to change the passwd. Is root the login name? No matter what combination I use, I cannot log in as the passwors is incorrect. Great guide! Thanks! Yes, root should be the login name if you have a password configured. Hi，do you mean if i don’t set the password, the system will has a automatc login? But it fail on this, authentication is still needed. Hello, thank you for a very handy tutorial as the full procedure at the debian live site is overkill for my necessities. Hello, this is a very useful guide! I’ll credit you in my project for the excellent tutorial. I’ve tried so many other half-baked tutorials… your instructions were right on the money ! Presto ! you can tweak to your heart’s desire, as the desktop will appear when booted. I’ll try out Xephyr, thanks! Quick question, does anyone know if you can capture kernel modules in the Live-Build? I’m asking because I tried and noticed once I boot with the live image the zfs modules are not loaded. Not only that, I noticed that “/lib/modules/3.2.0-4-amd64/updates/dkms” does not exist in the live image, nor in the build environment. I did install ZFS in chroot and I was able to run commands from it, but it seems it did not get “captured”. When everything else fails, add “insmod your_module” in /etc/rc.local. The commands from this file are the last thing run at startup. Will this change your tutorial for the ‘machine-id’ instruction ? I’ll have to wait until debian 8 to test it, I am on wheezy in this moment. drwxr-xr-x 2 root root 100 Jun 10 05:19 .
drwxr-xr-x 22 root root 480 Jun 10 05:19 .. Need to get 24.8 MB of archives. Selecting previously unselected package libuuid-perl. Selecting previously unselected package linux-base. Selecting previously unselected package libklibc. Selecting previously unselected package klibc-utils. Selecting previously unselected package initramfs-tools. Selecting previously unselected package linux-image-3.2.0-4-amd64. Selecting previously unselected package busybox. Selecting previously unselected package firmware-linux-free. Selecting previously unselected package linux-image-amd64. Selecting previously unselected package live-boot-initramfs-tools. Selecting previously unselected package live-boot. Selecting previously unselected package live-boot-doc. Selecting previously unselected package live-tools. Selecting previously unselected package uuid-runtime. As far as I understand the problem, you are trying to update on a filesystem mounted read-only. apt-get cannot write your new package. That’s bad, it will not work. You need a read-write filesystem, the live cd is read-only. I want to make custom Debian wheezy based live ISO with my TrafficSqueezer stuff in it. This allows users to directly use this Live ISO directly as a WAN optimization device without installation. TrafficSqueezer is a kernel based solution, so I need to boot this ISO with my custom kernel. For gui TrafficSqueezer is based on PHP/Apache/MySQL. So for GUI the live ISO should contain PHP-Apache, PHP-MySQL, Apache, as well MySQL DB,tables pre-installed and set. Can anyone help me or volunteer in this process please ? I tried doing with Ubuntu 14.04, but so far no luck. It fails to boot, and I get no assistance from anyone. I can understand Ubuntu is backed up by commercial component. So switching towards Debian. Some 6 years ago, I successfully did custom Knoppix ISOs. But now I completely forgot its steps and lost the TODO steps how i did the same. I need someone who i can interact and build the ISO. I got to the step for copying isolinux and then was jammed up ..
# cp /usr/lib/syslinux/isolinux.bin binary/isolinux/. — cp: cannot stat isolinux.bin: No such file or directory. Do you have syslinux installed? Seems to be working here. I’ve just built a new image and run it on qemu on a brand new Debian “wheezy” machine. Are you trying it on Debian “jessie”? Thank you for this excellent and well written tutorial. I’m definitely a beginner and was able to follow it and create my own bootable Debian USB. The only problem is that the physical media (the usb) is mounted as a read-only. The reason this is a problem is because I’d like to freely transfer files to the root of the usb and be able to take that usb and read the contents of it on a windows pc. Is there anyway to make that read-writable? I’m able to see the contents and read them but can’t write or save files to it, any help is much appreciated. Instead of dd command in the article, transfer the iso image to USB stick using a tool such as usb-creator or unetbootin. You can do the transfer on both Windows and Linux. I’ve tried this and still get the same thing, can’t write back to the physical USB stick as it’s mounted as read-only. Is it possible that I’m missing something in the xorriso command? Thank you for these instructions! I want to create an ISO image with custom tools which I could install on a system. Where do I need to change in your instructions for additional tools and install to HD options? Thank you in advance. It also has support to create install disks. Thank you for sharing this knowledge! Great job! What about EFI support? Do you have any solution? Probably you just need to use eltorito to generate compatible EFI bootable ISO, but, I am having trouble. If you have any solution please post Here! I need a clarification: your instructions do not specify whether packages of wheezy-backports can be installed via apt-get? The reason is I need the latest backported kernel for my hardware instead of the one supplied by the official release version. Also can I perform apt-get update && apt-get upgrade to ensure my LiveCD has the most recent security fixes before I proceed to create it? Yes, you can use backports to install a new kernel or any other piece of software from backports. You can also do apt-get update/upgrade to keep your build up to date. Would you like to share with us how to create a customized installer CD/USB for Debian Wheezy containing only the packages plus backports that we wish to have? I have read the Debian Wiki and a tutorial on how to use Simple-CDD to do it. But I am lost. A step-by-step guide would be most helpful. I’ll have to look into it. I know there is installer support in live-build tools (http://live.debian.net/manual/3.x/html/live-manual.en.html). The manual whose URL you provided in your reply contains too much technical jargon for an average guy like me to understand. That is why a step-by-step guide such as the one you wrote on “How to Build a Debian LiveCD” would be helpful. Something changed with syslinux in jessie/stretch. and there are several “menu.c32” now. I could not get to start the qemu/kvm of the remaster.iso. Thanks, I’ll have to update the post, things have changed in Jessie. I’ll have to take a look. The article was written on Wheezy, I’ll do a test on Jessie. Thanks! To produce a bootable usb stick out of the rootfs of a lxc (linuxcontainers.org) installed debian testing-iso. I found out that sweet debian runs on almost everything my friends have at home except mobiles. Things were going along well, but the mksquashfs command does not do any work. The file filesystem.squashfs gets created and just sits at 0 bytes. I was expecting the cpu to get busy compressing things. I must have made a dumb mistake on that command…. No idea why, but rebooting my machine allowed the mksquashfs command to run fine…. Thank you for this excellent and well written tutorial. I have a problem. I changed in the chroot directory “/etc/network/interfaces” to have a fixed IP. But after build the image, always boot as DHCP. I’ll try it out here, it should work! Ok. I found a solution. If I add “ip=frommedia” (without quotes) parameter in isolinux.cfg works fine. QEMU is not working well with my intel processor. I need to make this ISO image EUFI bootable. What should I do to achieve this? I tried to install apt-get grub-efi inside but no luck and I couldn’t make it working 😦 would be wonderful if you cn have a look. thanks! This will setup all the directories and conf files, then this to build it. This will build a minimal booting iso, you wont do much with it, but you can add all apps like xorg and your favorite DE like Mate,KDE,Gnome3 etc to the config scripts and rerun. Is there a workaround to return to chroot and continue working on your build after ‘lb build’ job is done and ISO files is made? The point is making a customised file system is incremental and I don’t want to rebuild all stuff from scratch. It takes time.